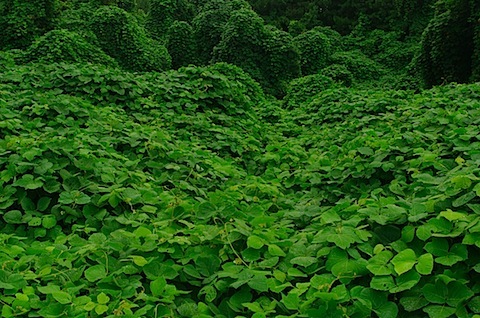 Intense non-stop long-term pain is like kudzu on your life. It covers everything and strangles it, including your enthusiasm, your will to live, and even those who live with you. You live in a landscape where all you see and feel is pain. You can see the shape of all those people and things in your life, but they no longer have their own identity. They are now tinged or drenched in the pain of your body. The people who love you most stand by helpless to do anything. Life as you knew it, comes to a halt. I am familiar with this kind of pain as I have lived with migraine headaches since I was 13. However, the doctors finally took me serious when I hit 30 and I have been on medication ever since. Every day, I take meds to prevent migraines, and my life IS my life again. Mr. Tot is not so lucky. Last year, he suffered almost 5 months of headaches, culminating with 5 days in a hospital bed which didn’t help, before he finally gradually defeated them, though we’re not entirely sure how. It seems like with kudzu and the tides, they receded for reasons we did not control. We thought they were migraines. Mr.Tot endured the pain, but Tot and I got strangled by the kudzu as well. It was a family crisis, the like of which I am not sure any of us could endure again… but we may have to. The headaches have hit hard again. Suspiciously similar to the last time, both in timing and in nature. They have been raging for the last 5 – 6 weeks, starting out somewhat mild, and ramping up with a vengeance. This time his doctor voiced doubts that they are migraines. After much discussion and detective work, we found another villain to interrogate – dental work. Mr.Tot had visited the dentist shortly before the headaches began both this time and last year as well. Could there be an end to this nightmare? Or would it get worse… Could things get worse? That’s a really bad question to put out there, because the answer is always yes, a big fat resounding YES!! !, no matter how bad things seem at the moment. Last night, before we could answer the dental question, Mr.Tot found a mole on the back of his leg and asked me to look at it. What I saw was pretty scary. I teased him about it but really, it looks like some alien insect has taken up residence. So this morning, he saw the dentist and the doctor. And he got an Ohhhh, and an AGHHHH!!! Ohhhh, his 3-d head x-ray showed a little black spot at the tip of his root canal which may be the culprit causing all the headaches. Consultation with the oral surgeon to follow… And AGHHH, what IS that thing on your leg? Better see a dermatologist… QUICK! So we’re riding the medical roller coaster, or at least Mr.Tot is, and I’m being dragged along as emotional baggage. Lots more doctor’s appts on the schedule and lots of hope and fear swirling around here like a hurricane. My tough, yet sensitive little Tot is getting battered by the storm. She is edgy and cries for no apparent reason, denying that it is even happening. This is as hard to witness as Mr.Tot’s pain. So tonight we took matters into our own hands. We’re going incognito hoping the pain won’t recognize us… Mr.Tot shaved off his curly locks, and I went a little crazy with the scissors and the bleach. It even seemed to work, for a few minutes. his pain level went down to a 4 until he saw me! Hey, it was worth a try. Here’s hoping the alien insect is harmless, and the black dot can be fought by the guys in white hats, or scrubs or whatever… We’re soooo ready to get off this roller coaster ride. “I’m being dragged along as emotional baggage.” This breaks my heart.